Chickpeas are packed with protein, fiber, and vitamins that are essential to a vegetarian diet. 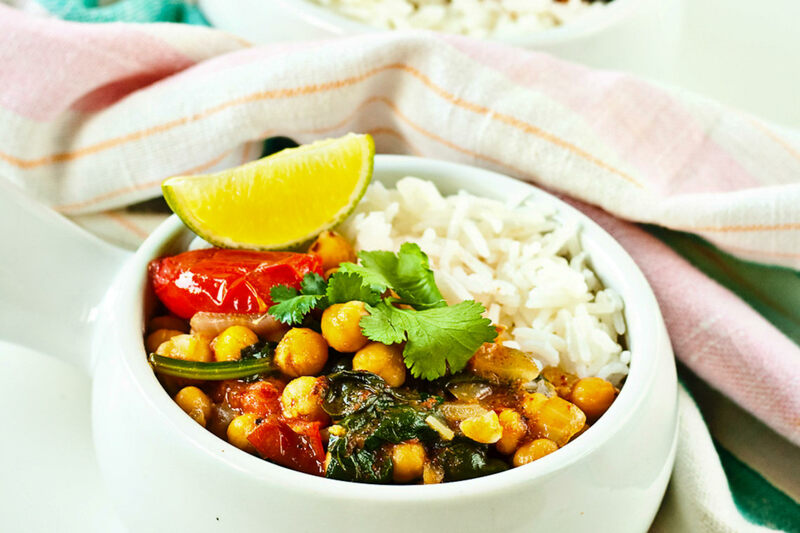 That makes them a great base for this vegan coconut curry. Using canned chickpeas means no pesky soaking or boiling, and the entire dish is ready in 20 minutes. Quickly cooked cherry tomatoes add color and flavor, and wilted spinach provides iron and tons of nutritional value. Seasoned with onion, garlic and red or green curry paste, this healthy dish is perfect for busy weeknights. Serve with basmati rice, a few cilantro leaves, and a squeeze of lime. Boost the amount of protein in this curry by adding some thinly sliced chicken. Increase the amount of oil by 1 tablespoon, and fry the chicken before adding the onions. Or cook some extra-firm tofu in a skillet until browned and add to the curry. For extra nutrients, stir in 2 cups of baby kale at the same time as you add the spinach. This makes a great a great lunch to bring to work the next day; pack in a resealable container like a glass jar and bring to work! Per Serving: 464 calories; 33g fat; 36.8g carbohydrates; 13g protein; 0mg cholesterol; 838mg sodium. Made this yesterday for a vegetarian Keto lunch. Very easy to make and full of flavor from the curry paste. I used red curry paste which had a really nice spice to it. I want to try this dish again with yellow curry paste next time. 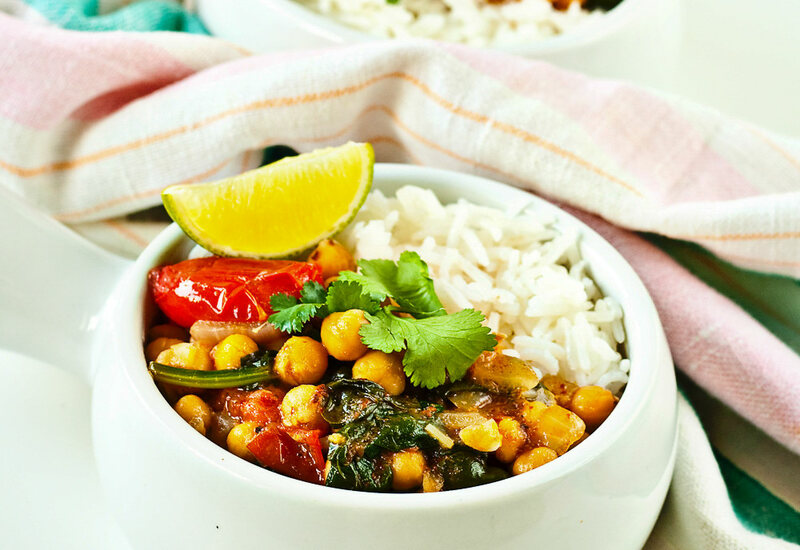 This was an incredibly easy and delicious curry dish! Very simple and not intimating like some Indian recipes. This is great for newbies! Fried chicken was the perfect addition to this Spanish curry. I also added baby kale with the spinach. Great recommendation! I made this chickpea and spinach curry, but added some chicken because I know the boys in my house would be otherwise disappointed! It was a great dish! We served it with rice and that made for a complete, well rounded dish. Took out chickpeas and added shrimp for protein. I also stirred in kale as suggested. 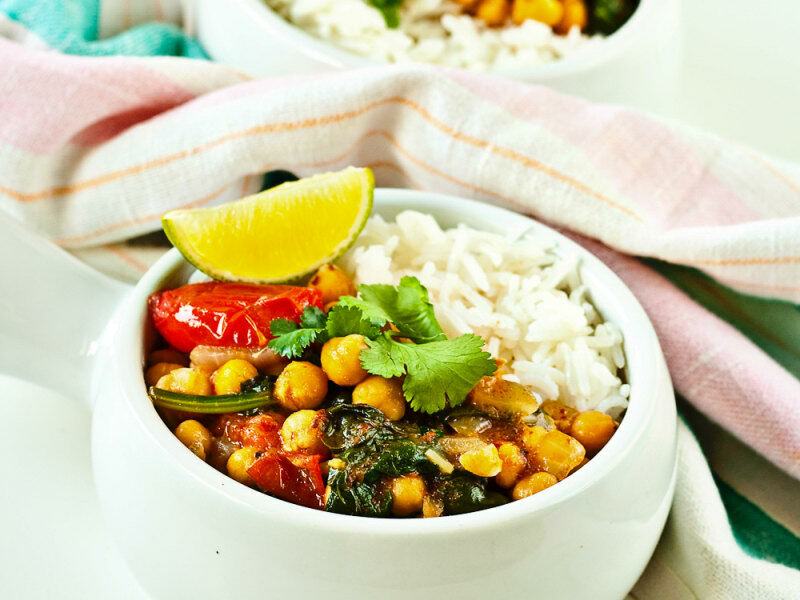 This is a good curry recipe for dinner and I pack the left overs for lunch.